Malcolm Gladwell has an amazing way of changing the way his readers view the world. With books like The Tipping Point and Blink, Gladwell has challenged the way we think about everything from perception to success. With David vs. Goliath, he once again delves into history and the present to show why sometimes the underdog wins. Not only does he win, but he is uniquely positioned to win due to the exact reasons he’s the underdog in the first place. With stories ranging from the actual David and Goliath three thousand years ago to present day stories of people overcoming seemingly insurmountable competition, Gladwell has written a compelling and extremely readable book. Is it easy to read? At first glance, David vs. Goliath might be a little intimidating to those who are not quick readers. At over 300 pages, it’s not a small book. However, once you get into it, you’ll be surprised at how fast it goes. Not only is it easy to read, it’s also quite entertaining. There are no complex technical concepts to grasp or pages of wordy research, so you can breeze right through it. Does it make you think? Does it ever!! There were numerous parts that I read and had to stop for a moment afterward to absorb the implications. It certainly does change the way you think about history, current events and even people/situations in your own life. Can you easily apply concepts to your own life/business? This is the only place where David vs. Goliath is not extremely strong. However, I don’t think Gladwell intended it to be a book that you could use in this way. There are a few examples/stories that you might be able to use to your advantage. Even if you are not technically an underdog, you can use this book to think like one, and that could be useful in a number of situations. Has it/will it change your life in any way? Because David vs. Goliath does an amazing job of challenging the way you (and society) views underdogs, it should change the way you think and therefor change the way you live to some degree. It probably will not be monumentally life-changing unless you are truly experiencing a David vs. Goliath situation in your own life, but it will certainly add depth and understanding when you do come across one. I highly recommend all of Gladwell’s books, and David vs. Goliath is no different. Whether you currently view yourself as an underdog or not, you should read this book just for the sheer amount of ‘thinking outside the box’ information. 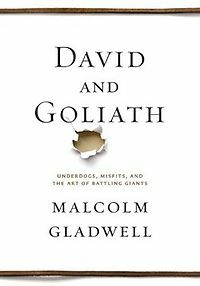 In David and Goliath, Malcolm Gladwell challenges how we think about obstacles and disadvantages, offering a new interpretation of what it means to be discriminated against, or cope with a disability, or lose a parent, or attend a mediocre school, or suffer from any number of other apparent setbacks. In the tradition of Gladwell’s previous bestsellers—The Tipping Point, Blink, Outliers, and What the Dog Saw—David and Goliath draws upon history, psychology, and powerful storytelling to reshape the way we think of the world around us.